Full disclaimer: I received for free an uncorrected proof of this book on Goodreads Giveaways. I am not obligated to write a review; no compensation exists outside of my included Amazon affiliate link. It is not often that I feel compelled to review a print book. Not that there’s anything wrong with print books, it is simply a matter of space restrictions. Due to my limited shelf space, any books I consider “keepers” I will eventually replace with digital copies, make the print copy available for some other reader (typically by releasing them into the wild via BookCrossing), and then review the digital copy at my leisure. Rarer still am I compelled to review a book before I’ve even finished reading it. But this one….? I think I got about halfway through the book before I started scripting out my review. The first thing to note is that this is considered a psychological thriller. It is not fantasy in the traditional sense of the word, but the available genetics technology could give it science fiction leanings. This despite those being two completely different categories on Goodreads, and thrillers (psychological or otherwise) being yet another genre. I point this out because there is simply not time enough in the world to read every worthy book, so my own giveaway entries are limited to the fantasy category. As a result, this book is well outside of my usual fare. Anyhow, the book is a psychological thriller. This is immediately obvious in one character’s introductory chapter, and slowly becomes just as obvious for two other characters as their stories unfold. The other two major characters lean towards the romance genre, also outside of my usual choices. And yet, I was compelled to keep reading to see how things would work out for the characters… or how events might blow up in their faces. I found the story fast-paced, difficult to put down, even in the midst of getting ready to go to work or attempting to continue one of my own drafts. The length of the chapters, which provided a tidbit about a given character’s situation before shifting focus to yet another player in this game, made it easy to read for hours without noticing that so much time had passed. I was invested in finding out what happens next? There were a few typos to be found, noticeable while reading but too forgettable to go back and find them again. And there was… inconsistency. But not inconsistency from the author. Rather, there was the same sort of inconsistency that I expect real people would display should such a DNA test ever be devised in the real world. Case in point, we have the constant correlation between the influence your DNA has on pheromones…. and love. I’m no scientist, but as far as I can tell these two are not the same thing. DNA is all about biology, what your body wants. Pheromones, likewise, are about attracting the person you are best suited to procreate with…. the need to pass on your genetic code to a new generation. Love is about how you feel, what your (metaphorical) heart and head want. And unless your religion teaches that the soul is found in the red blood cell, a DNA test could never identify your soul mate for you. And yet these people put so much stock into the test that even when they’re mis-matched, most of the time they fall in love because the test says they should. DNA and love could go hand in hand, this is true, and I would not presume to judge someone who finds their perfect match from a science-based dating app. And there are certainly enough people that the app has helped that it bears serious consideration. But there were also far too many relationships that broke up over the app, with every such ex-couple rationalizing that “science says so” and completely ignoring the personal responsibility that it was their choice to break up. And if, as happened between two characters, my SO’s reason for pushing me into taking the test is that they’re not happy thinking we’re right for each other when we could know for sure…. that doubt tells me more about our compatibly than the DNA test ever could. As one (significantly absent) character was known to have believed, taking the test could take the fun out of building a real relationship with someone I love. Another inconsistency (which I expect would also exist in the real world) is that there is a fine line between supporting someone’s choice to take the test and encouraging that decision. And if you were to push someone into meeting their Match simply because “the test says so,” as one of Mandy’s sisters had done, then you are suggesting that any relationship would be lesser simply because it does not have the scientific backing. Mandy did not call her sister’s relationship “second best,” she called her own potential relationship with a non-Match second best…. and her sisters encouraged that line of thinking from the very beginning. Then there is the question of being “in love with” someone you’ve never even met… or when you first become aware of that love. Take Nick’s situation. He, and his DNA Match, are both men in long-standing relationships with other women. Neither of them are homosexual, at least until the DNA test tells them otherwise. And when they first meet they do not feel any of the internal fireworks often described to mean “this is my perfect partner.” No, it’s only when they meet each other’s eyes that they feel drawn to each other. Or let’s return to Mandy’s situation, and her love for a dead man she’s never met. I’m calling hypocrite on the sisters again on this one; if you can be “in love” enough with your Match to meet a total stranger just because a DNA test says so, then you can be “in love” with a dead man you’ve never met just because a DNA test says so. And as for her pregnancy from that dead man? Yeah, I can agree that it’s a little weird, but ethically how is it any different, as Mandy had pointed out (based on what she was told of the situation), than pregnancy from an anonymous donor? And given the Match’s insistence on equating genetics to love, how is it emotionally any worse than that anonymous donor? Had Mandy not thought to contact the ex-girlfriend, I would happily have continued believing, as she had, that there was nothing wrong with her decision or her “in-law’s” support… until it was too late. And one final all-too-real inconsistency, let us return to the subject of personal responsibility. On the one hand, the creator of the app has truly only committed one crime in the pursuit of science, and that is building up her database by unethical and illegal means. And yet the people who are Matched according to this app–willfully or otherwise–take no responsibility for the choices they make after… including their choice to break up with a good unMatch or to remain with an abusive Match for no better reason than that a Match is supposed to be “perfect.” A good deal of the “thriller” aspect stems from this discrepancy, as one person is determined to have revenge against that creator for his own father’s choice to leave his mother in favor of his Match. On the other hand, the creator has committed a serious error that is all too common in any leadership scenario…. she accepts the praise when things go well but refuses the blame when things go wrong. Sorry, sweetie, but you either take both or neither; either you are ethically and morally responsible for all of the relationship choices people make because of your app, or you are responsible for none of those choices. If I could pick out just one single thing that I did not like about the book, it would simply be this: with the wide cast of main characters, none of their stories ever truly overlap. The closest we get is one of the main characters being the creator of the app, and another being a serial killer whose crimes are mentioned on the news now and again, but none of those main characters ever actually meet…. not even in passing. This book is, in effect, not one story but an anthology of five disconnected stories. So, my readers…. How far would you go to find The One? 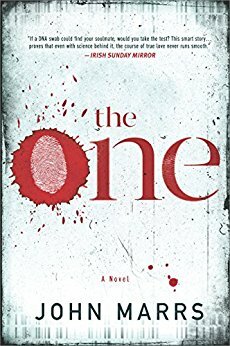 This entry was posted in Book Review and tagged Amazon Affiliate, Amazon.com, ARCs, dating apps, dna test, goodreads giveaways, psychological thriller. Bookmark the permalink.